The liger is a big cat born from the breeding of a male lion and a female tiger. This combination produces an offspring with more lionistic features than if the reverse pairing had occurred. That would produce a more tigeristic creature known as a tigon. What does a liger look like? Some ligers grow impressive manes, while others do not. Ligers are prone to giantism and grow much larger than either parent. 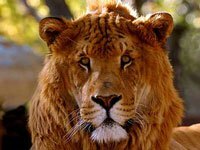 A liger looks like a giant lion with muted stripes but like their tiger ancestors, ligers like swimming. Ligers only live is special zoos and research places. You can't find them in the wild because tigers and lions don't mate with each other on their own. What does a liger eat? A cat is a obligate (must eat meat) carnivore. In the wild a Tiger's favorite food is Deer and Wild Boar but this cat will eat a wide range of large and small mammals and including fish, frogs and crabs and some vegetation such as grass to aid digestion. 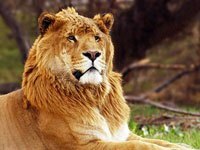 The Lion in the wild will eat any medium to large mammal, such as Buffalo, Zebra, Wildebeest, Impala, Gazelle. 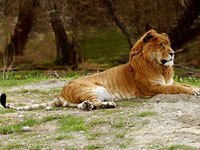 A tigon or tigron is a hybrid cross between a male tiger and a female lion or lioness. 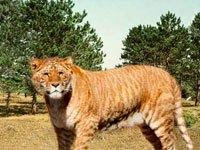 The tigon is not currently as common as the liger, however, in the late 19th and early 20th centuries, tigons were more common than ligers. Tigons tend to be the same size or smaller than their parents and have less angular heads. They have a stronger striping pattern generally. Download free Liger wallpapers, click on the image to open the large version. Print free Liger coloring pages, click on the image to open the large version.